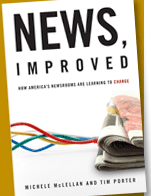 The book includes resources and results of strategic training initiatives conducted in newspaper newsrooms between as part of the John S. and James L. Knight Foundation’s Newsroom Training Initiative. This $10 million initiative helped dozens of newsrooms raise their skill levels and become more adaptive to meet the challenges of the digital age. Between 2003 and 2007, the initiative demonstrated that training, linked to actionable goals and encouraged by forward looking leadership, drives innovation and audience appeal. The concepts developed in this initiative are at work today in tailored consulting services offered by Knight Digital Media Center at USC Annenberg, where News, Improved director and co-author Michele McLellan is the senior programming consultant. RESOURCES, including handouts that will help you shape change efforts in your newsroom. CASE STUDIES detailing newsroom transformation.